Sounds impossible, right? I would have doubted its existence myself, until a trip to Jungle Jim’s in Cincinnati, Ohio last year. My eyes were opened to so much potential and awesomeness. It’s…seafood…made from plant-based ingredients. And while my journey into the vegan seafood began with Sophie’s Kitchen Breaded Vegan Fish Filets…which were…eh…okay…I have found other products by this company to be amazing. Like…you wouldn’t even know it wasn’t seafood. I’m not kidding. Taste is sometimes even better. Texture is spot on. Yep…I’m in love with this company. So much, in fact, that the Breaded Vegan Shrimp are always in my freezer. Between the numerous natural food stores that I shop at each weekend, there is a variety of Sophie’s Kitchen options available. My most trusted spot, however, is Whole Foods, as they seem to have more of the products than anywhere else. And on a recent journey, these amazing products were…ON SALE! So, my roommate and I grabbed one of each. And…with Fat Tuesday’s arrival…I was in the mood for some Cajun food. This meant I took the Vegan Prawns and rubbed them with a Cajun seasoning (a la Emeril Lagasse) and cooked them in the oven at 375°F for 6 minutes. This really is that simple, I swear. Why Cajun shrimp? Well, when I was at Disney World this past January and was meeting Tiana (from The Princess and the Frog), I asked how her restaurant was going and explained that it was a dream of mine to open my own. She said to make my signature dish an amazing Cajun Shrimp Alfredo. So…here I took her advice…except I kept mine vegan and gluten-free. Because…I want to be able to eat it, yes? Yes! Well, being that this was the first time I was eating the Vegan Prawns from Sophie’s Kitchen, I didn’t stir them into the pasta, but rather laid them on tip. And it worked. The dish looked beautiful and the pasta came out perfect. I made up a sauce using So Delicious Dairy Free Unsweetened Cultured Coconut Milk, almond milk, nutritional yeast, vegan butter, garlic, fire roasted tomatoes, and a bit more Cajun seasoning. Because Fat Tuesday is tonight and I had another idea going in my head. This time…a Cajun Shrimp Po’boy. With my vegan slaw on a gluten-free sandwich roll. This HAD to happen. I mean…for real. I once again rubbed the Vegan Prawns down with my Cajun seasoning, but this time I decided to cook them up in a pan. I toasted the rolls in the oven, added some local lettuce, slathered them with some slaw and topped them off with the Vegan prawns. My own, personal twist on a Po’boy. Getting in the Mardi Gras spirit here! I cooked the prawns in coconut oil and…OH MY GOODNESS…that was magic. The Cajun seasoning blackened up perfectly. And these were…winning! Oven baked or cooked in the skillet, I was beyond impressed with the flavor, texture, and overall taste of the Vegan Prawns. They were fantastic cooked in the coconut oil in the pan though. Reminded me of when I used to help my mom make her garlic lover’s shrimp (with real shrimp, mind you!). And, I think next time I purchase these (and, yes, there will be a next time), that’s what I’m going to do with them. YUMMY!! I thought these meshed well with the other flavors I paired with it, in both dishes. And while baking them in the oven was good…the pan cooking was beyond amazing. I think I found my new favorite way to prepare them. In fact, next time I get the Vegan Scallops…that’s how I’m cooking those as well. Honestly, these are fantastic. 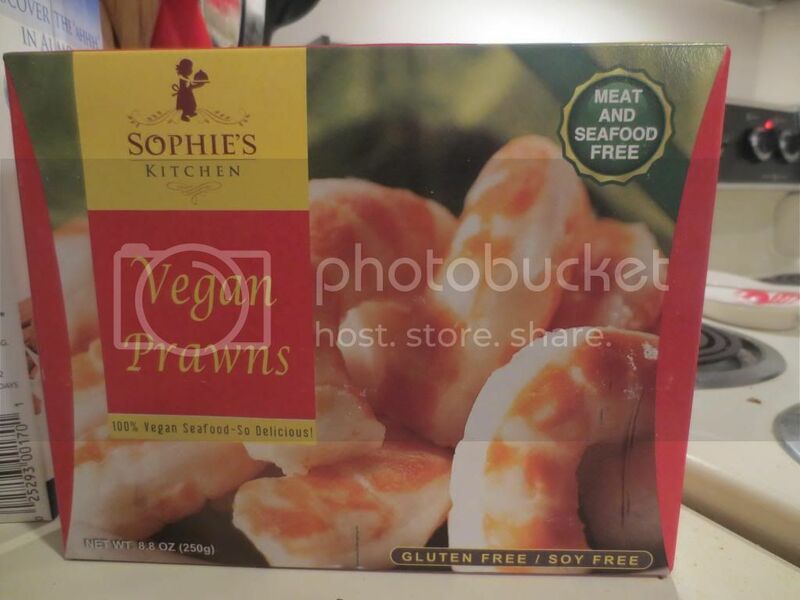 As far as ingredients go, the Sophie’s Kitchen Vegan Prawns are made from water, konjac powder, beta glucan, potato starch, paprika, organic agave nectar, sea salt, carageenan (seaweed based gelatin), alginate (from seaweed), and calcium hydroxide. The Vegan Prawns are soy-free, gluten-free, 100% vegan and plant-based, non-GMO, contain no artificial colors, preservatives or MSG. These have no added sugars or artificial…anything. Honestly! Nutritionally speaking, each box contains 3.1 servings…or 10 of the Vegan Prawns. A serving is 3 prawns, but being as I’m splitting this with two people over two days, we each had 2.5 Vegan Prawns. 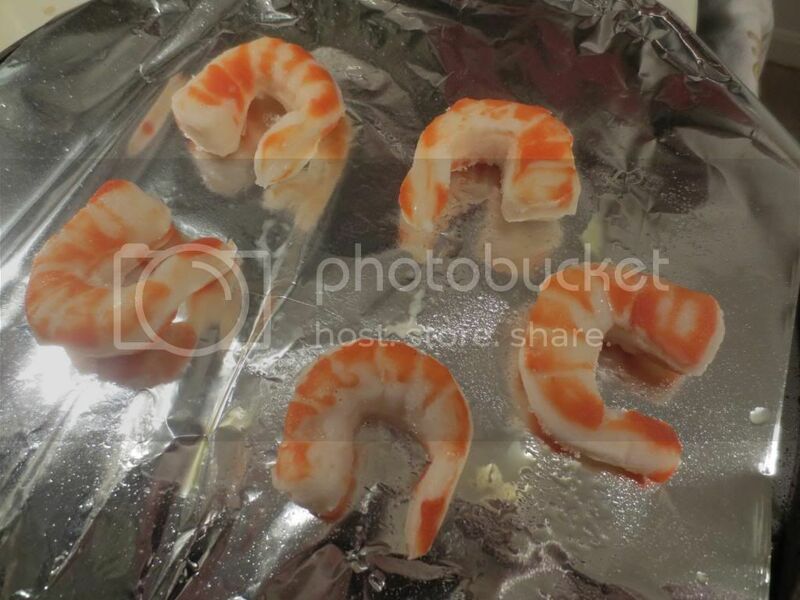 That being said, a normal serving of the 3 prawns would give you 50 calories. This product is fat free and cholesterol free. A serving will also provide you with only 150 mg sodium and 1 gram of sugar. Loving that. And finally, three of the Vegan Prawns provide you with 3 grams of fiber and less than 1 gram of protein. Discovering Sophie’s Kitchen products has been amazing for me. I often keep one product stocked in my freezer at all times. You never know when you might need it. If you haven’t tried these yet…go to your local natural foods store and check their freezer section. Serious yummy vegan seafood eats here! This entry was posted in Bread, Cajun, Clean Eating, Entree, Food, Frozen, Gluten-Free, Pasta, Products, Review, Sauce, Vegan, Vegetables, Vegetarian, Yogurt by The Celiathlete. Bookmark the permalink.